A middle school math teacher provided the inspiration that started Annabel Flores on a career trajectory that’s landed her at Raytheon, where she’s one of the company’s rising young stars. As Product Line Director for the Airborne Early Warning and Reconnaissance Systems department in the Space and Airborne Systems (SAS), Ms. Flores is the first female and first Latina program director of Raytheon’s AEWRS portfolio. She is responsible for a broad product portfolio, including airborne radar and surveillance solutions for manned and unmanned systems for both domestic & international customers. Ms. Flores manages over 20 direct reports and more than 500 employees world-wide, and she’s responsible for over $300M+ of annual bookings and sales. A love of math and science, and the encouragement of her teacher and her parents, led Ms. Flores to the Massachusetts Institute of Technology, where she pursued an engineering degree. After graduation she joined Raytheon as a mechanical engineer in the Electronic Systems division. Her work on prototypes of airborne radar concepts led to the definition of new active electronically scanned arrays (AESA) antenna architecture and enabled the company to win the F/A-18 radar competition. Ms. Flores’ work in product development solidified her desire to pursue a master’s degree in mechanical engineering. Accepted into Raytheon’s Advanced Fellowship Program, she returned to her alma mater as part of a select, two-year dual degree program that allows students to pursue an M.S., Engineering degree as well as an MBA to develop management expertise and technical abilities. Completing her research fellowship at Raytheon Missile Systems, Ms. Flores focused her research project on the development and implementation of the Advanced Manufacturing Development Center, a new institution at Raytheon designed to develop manufacturing technology roadmaps. Upon graduation, she returned to the AESA antenna development team, where she was initially responsible for the design of the cooling system for the F-15C APG-63 V(3) AESA radar before advancing to lead the program’s antenna mechanical team. A move to work on trade studies for new customers motivated Ms. Flores to join Raytheon’s Business Development Leadership Development Program in Washington, D.C., where she worked first with the U.S. Business Development Army Team before joining the Intelligence & Information Systems division (IIS). At IIS, she worked on projects including the Multi-Int Enterprise Campaign, as well as tunnel detection in border regions. 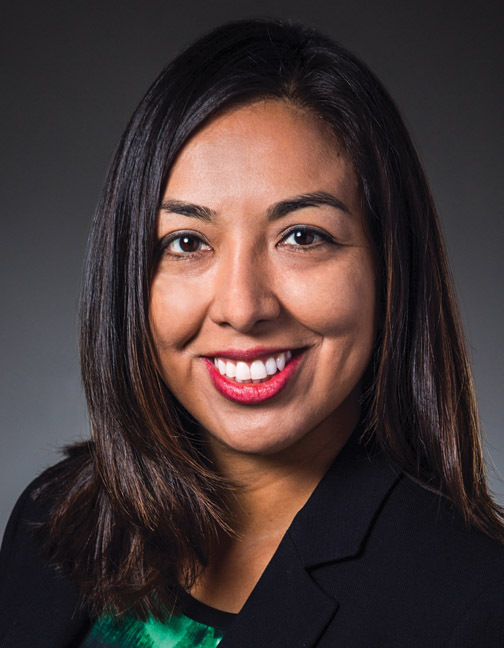 Despite Ms. Flores’ success with business development, she missed working with engineering teams, so she sought a new opportunity in program leadership, taking a staff executive position as the Director of Radar Sensor Systems within the Intelligence, Surveillance, and Reconnaissance Systems division of SAS. Later, she become a Deputy Program Manager on the APY-10 radar for India’s P-8I maritime patrol aircraft program. Ms. Flores went on to work as Program Manager for the EO/IR sensor suite for the MQ-9 Reaper drone and collaborate with the U.S. Navy to develop an applications-based architecture for the P-8A Poseidon aircraft. Before her ascending to her current position, she successfully turned around a struggling development program involving terrain following/terrain avoidance radar. An active member of SPHE, Avanza, the Raytheon Hispanic Organization for Leadership & Advancement, and the Raytheon Women’s Network, Ms. Flores has been selected as a Raytheon High Potential Employee for future advancement.